- THE TRIANGLE I - (10 Days/9 Nights) - 3 Nights Athens, 3 Nights Mykonos & 3 Nights Santorini. - 2 Private Transfers in Athens, Airport/Hotel & Hotel/Port. We visit the city, the Acropolis, Parthenon and the Museum. Transfer to the harbor to embark on the high speed ferry sailing to Mykonos. Arrive in Mykonos, disembark and transfer to the hotel. 2 Days at leisure to explore the "jewel" of the Aegean Sea. Transfer to the harbor to embark on the ferry sailing to Santorini. Arrive in Santorini, disembark and transfer to the hotel. 2 Days at leisure to explore the “black pearl” of the Aegean Sea. Transfer to the harbor to embark on the high speed ferry sailing to Piraeus. 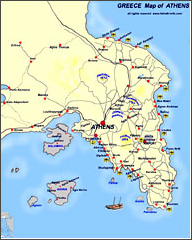 Arrive in Piraeus, disembark and transfer to the hotel in Athens, (on your own).